42 participants competed. 26 made it to the final. Portugal got its first Eurovision victory. What has happened to all the participants after they returned home from the contest? Who released new music worth listening to this summer? We checked up on all of them. 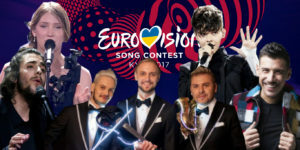 We are now approaching the end of July, and it has been more than two months since the nail-biting Eurovision weeks back in May in Kyiv, Ukraine. As the juries and viewers across Europe and Australia cast their votes, Portugal ended up winning the Eurovision Song Contest for the very first time. But what have all the finalists been up to since then? In a series of three articles, we check up on the 26 acts who made it to the final. Who is taking it easy, and who is in full swing with new singles, albums and tours? Let’s start. 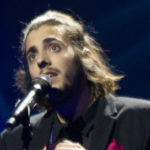 Salvador Sobral won the Eurovision Song Contest this year with a glorious 758 points and has taken the world by storm with his victory, and started discussion throughout Europe (and Australia). Some comments were critical, some were quite bad, but most of the world fell in love with the guy who quietly won Eurovision, standing out from all the other acts with a simple performance. Salvador won the contest with the song Amar Pelos Dois, meaning “Love For Two”, a song that was composed by his sister, and his ballad certainly moved the audience when he invited his sister up to sing the song with him at the moment of his victory. As a devastating wildfire broke out across Pedrogao Grande in central Portugal, Salvador sang at a charity concert on the 27th of June to gather funds to the victims of the fire. Sixty-four people were injured, and two hundred killed. All the funds from the concert went to help the injured victims as well as to rebuild the affected areas. The concert was held in the MEO Arena in Lisbon, which is top candidate to host the 2018 Eurovision Song Contest. Along with that, his Eurovision winning ballad is the most-streamed Portuguese song ever on Spotify, and he has resumed his summer tour. Kristian Konstantinov Kostov made Bulgaria proud as he rose up the scoreboard and came second, Bulgaria’s record at the Eurovision Song Contest after Poli Genova came fourth in 2016, with his song Beautiful Mess. He made an appearance in Athens, Greece for the MAD Video Music Awards 2017 at the end of June, just as he performed at the MTV Varna Beach in Bulgaria mid July along with Bebe Rexha and Poli Genova. SunStroke Project is a Moldovan musical trio made up by Sergei Yalovitsky, Anton Ragoza, Sergey Stepanov. Sergey Stepanov is the most famous of the three known world wide under the name “Epic Sax Guy” which he got after the Eurovision Song Contest in 2010. Viewers loved the Epic Sax Guy so much that they even uploaded different remixes, mashups and even a ten-hour long loop of his famous tune. This was repeated again this year. This year, in 2017, they represented Moldova again, with the song Hey Mamma, which featured another tune played by Sergey Stepanov with his saxophone. Afterwards, the members of SunStroke Project gained 25% of the votes of the listeners of the online ESC Radio, and they were given the award ‘The Best Group’ at this year’s Eurovision Song Contest. Ellie Blanche Delvaux, known as Blanche, is this year’s Belgian entry to the Eurovision Song Contest. She competed in the final with her song City Lights and ended, fairly well, fourth. It has been rather quiet around her, but in mid July, she shared with all her Facebook fans a new acoustic version of her entry City Lights. Leading up to this year’s contest, Blanche also performed several acoustic versions of the song. 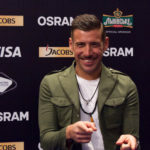 Francesco Gabbani is one of this year’s Eurovision participants that have been busy since representing Italy. He has recently released an album named Magellano. He has been touring around all Italy to perform the nine songs from his album which of course includes his Eurovision entry Occidentali’s Karma. He rose up the Italian single chart and came second as the most listened artist in Italy with the new single Tra Le Granite E Le Granate. Also, he was a guest at the World Pride in Madrid, Spain, and made an appearance at the MTV 2017 Awards in Rome. Maria Ilinca Băcilă is a Romanian yodeler and singer. She represented her country at this year’s Eurovision Song Contest with Alexandru Ionuț (known as Alex Florea). With the song Yodel It! they finished seventh. So far there is no news from Ilinca, but Alex Florea has been appearing in different shows, one of them being ‘FANtastic Show’ with Ank Neacsu. József “Joci” Pàpai is a Hungarian singer, rapper and guitarist of Romani descent. He represented Hungary at the Eurovision Song Contest this year with the song Origo. Recently, he premiered his newest song Özönvíz. He performed the song live on Hungarian TV channel, Duna, on the 18th of June. Özönvíz, meaning Flood, is a love song, describing how love turns into a flood of stormy emotions when the other loved one is not near. His Eurovision dancer, Alexandra Virág also was the dancer on his live performance. Isaiah Firebrace is an Australian singer who competed in the eighth season and won the X Factor in 2016, and went on to represent Australia at the Eurovision Song Contest this year with the song Don’t Come Easy, and came ninth. Recently, he has been touring in Belgium and Norway. On Facebook, he told his followers that new music will come soon, so we’ll be waiting to see what he has for us this time. JOWST feat. Aleksander Walmann represented Norway at this year’s Eurovision Song Contest in Kyiv, Ukraine, after winning the Norwegian Melodi Grand Prix final with the song Grab The Moment. JOWST was backed up by vocalist Aleksander Walmann on this song. None of them released any new music since the Eurovision Song Contest, but they have been touring. It is yet unknown whether or not the two of them will continue their collaboration on future projects. The three sisters, Lisa, Amy and Shelley Vol, two of which are twins represented The Netherlands this year with the song Lights And Shadows, and ended 11th on the scoreboard. They received a gold record for their album We Got This. The album got into the Top 100 Albums. “You know what is so beautiful? This is our debut as O’G3NE and it’s all our own work, no covers,” said Shelley Vol, surprised of the news of the gold plague. But all of us are with O’G3NE during this very difficult time for them – their mother, Isolde Vol-Melee, died of cancer at the age of forty-seven. She was the inspiration for their entry Lights And Shadows. Alexandra Maquet or just simply Alma, is a French singer and songwriter, who represented France at the Eurovision Song Contest this year with the song Requiem, finishing twelfth. She received the title Best Performer at this year’s Eurovision Song Contest by RTE who also called her the second most stylish act. Together with famous Armenian artists, Alma will shoot in an Armenian movie called “Armenia”. She will play together with Mikael Aramyan, Hovhannes Azoyan, Sos Janibekyan, Arsen Grigoryan and Satenik Hakhnazaryan. Stay tuned as we soon return with part two and three where we check up on the remaining finalists from this year’s Eurovision Song Contest.